This newsletter is viewed best on a large screen. It is not formatted for printing. We recommend viewing this edition with a Google Chrome browser.
" The man who has experienced shipwreck shudders even at a calm sea." lighthouses of Brittany, contributed by our friend and lighthouse aficionado, Betty Werther. The French word for lighthouse is 'phare', pronounced 'far'. 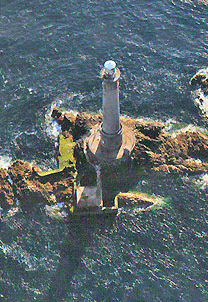 Le Phare de Créac’h on the Island of Ouessant (Ushant in English) off the coast of Brest on the westernmost tip of France, is celebrating its 150th anniversary this year. For about 50 of those years, Europe's most powerful lighthouse has been lulling - you might say 'flashing' - me to sleep with its two white beams every ten seconds through my bedroom window in our family's vacation cottage just across the bay. 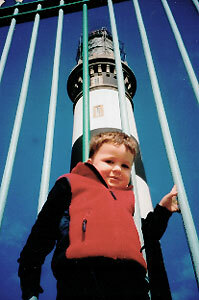 One of my grandsons, Yann, who is half Breton, could identify all the Ouessant lights almost before he could talk. For much of his childhood summers he sat on my window seat at sunset - refusing to go to bed until the Créac'h began flashing. Brittany (Bretagne), especially La Finistère, (meaning 'end of the Earth'), is crowded with more lighthouses than any other region of France. Of the country's 120 lighthouses on over a nearly 2000-mile coastline, 57 are located in Brittany's five départements, and 22 of those are in the Finistère. Ouessant, an island with only an eight by four kilometer surface, leads the show with a cluster of five: two on land, the Créac'h and Le Stiff, and three at sea, Kereon, Nividic and La Jument. Yann named his cat Nividic! Often blanketed in fog or beaten by tempests, Ouessant is surrounded by some of the most treacherous waters anywhere. For mariners over the ages, the dictum was "Qui voit Ouessant voit son sang" - "He who sees Ouessant sees his blood". Some 50 shipwrecks are recorded in her rocky depths, about half of which can be explored through the local diving center. The concentration of warning signals - lighthouses, buoys, beacons and foghorns - can also be explained by the island's location at the mouth of the English Channel off the 'Rail de Ouessant', the island's Shipping Fairway or traffic lane, which accounts for 25 percent of the world's maritime traffic - over 54,000 vessels a year. > to read about a four-year old's remembrances of the steamship Normandie. > if you want an enjoyable culinary tour of Normandy and Sussex, you will want to get a copy of Rob Silverstone's A Mule Across the Water ~ and read our review on The Bookshelf. > for the results of a survey with some interesting insight into common dislikes about staying at hotels in our Travel Tips column. > to visit a few more lighthouses in Featuring: Lighthouses of Normandy and Brittany - September 2014. > for an update on the voyage of the Hermione replica frigate ~ an adventure from France to the United States' eastern shore honoring the original Hermione and its famous passenger, Gilbert Motier, the Marquis de Lafayette. TWISTED TONGUES . . . Welcome to Twisted Tongues, a French word game everyone can play. See if you can come up with the correct translation of the phrase in question. You may be quite surprised by how it differs from what you first thought it meant. Answer from our Summer issue: "Filer à l 'anglaise". It doesn't mean to spin fabric English style, but means to sneak away without doing or saying anything, as in 'take French leave'. Phrase: "Ah, la vache!" = Does it mean "Oh, the cow!"? No. Can you guess? Look for the correct translation in our Winter 2015 newsletter. Have fun! by enjoying one or more of his Paris Through the Ages Strolls. Visit our Marketplace page for a complete list of strolls and information about Arthur. 18th century château, enjoy cooking lessons, wine and cheese tastings, a hot-air balloon ride and more! Click on the banner to sign up or learn more! to assist travelers with suggestions and web sites that we have found very useful.